A rare owl visitor to Shetland has been spotted. The sighting of the Tengmalm's owl is believed to have been the first of the breed in Shetland in over a century. It was observed after swooping into a garden at Tumblin, on the west side of the islands. It was sitting on a tree just outside Jackie and Erik Moar's bedroom window. Former wildlife photographer Dennis Coutts said: "The last one officially recorded in Shetland was back in 1912." The RSPB confirmed recorded sightings on UK shores were "very rare". The largest European breeding populations are believed to be in countries including Russia, Sweden, Finland and Norway. Mr Coutts explained: "Had it not been for Jackie photographing this bird and putting it on a website we would never have got to know about it." He said that by coincidence the new owl was first spotted on 19 February - the same date the last bird, which was kept in a barn, had died 107 years previously. 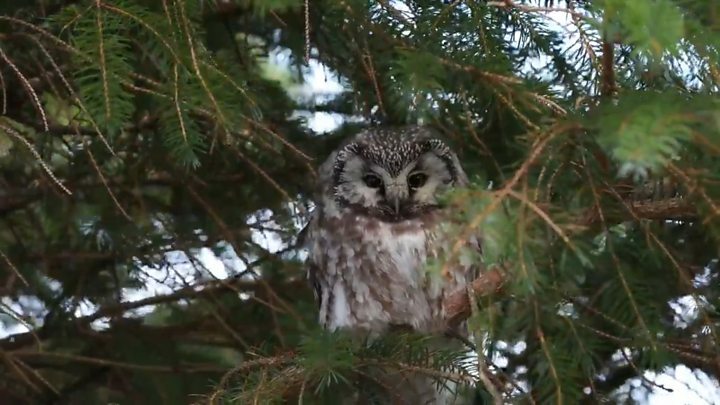 Wildlife photographer Hugh Harrop also captured a short video of the owl, which has proved popular on social media.